Instant Pot Lasagna is warm, cheesy and delicious. 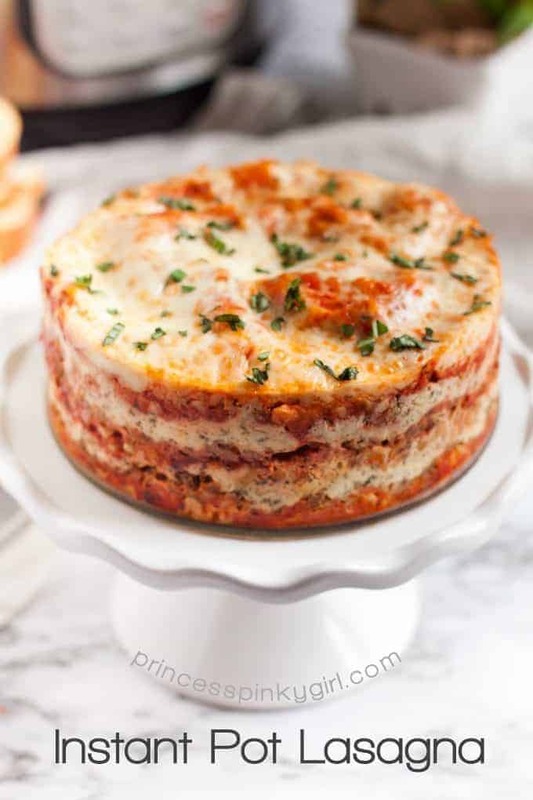 Just like a traditional lasagna recipe, it is layered with your favorite ingredients. We use no-boil lasagna noodles and it bakes in no time in your pressure cooker! This Instant Pot dinner will literally wow your family! My family loves lasagna! Vegetarian Lasagna, Spinach and Portabello Mushroom Lasagna Roll-Ups, Lasagna Soup and even our dessert chocolate lasagna. 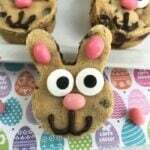 They are always a hit in our house! I got a brand, new shiny Instant Pot for the holidays and I have been having a blast testing it out! 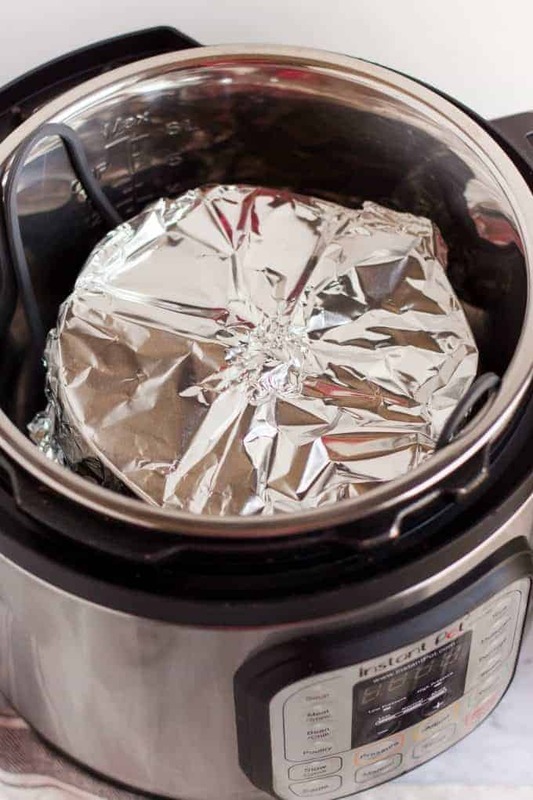 Do you have a new Instant Pot that you haven’t even taken out of the box yet because you are afraid of it? Don’t be scared! We can help! Check out our How to Use the Instant Pot article here. The Instant Pot (or pressure cooker) is literally my life right now. I am always rushing around and before I know it, it is almost time for dinner. So I need some easy dinner recipes that I know my kids will love. 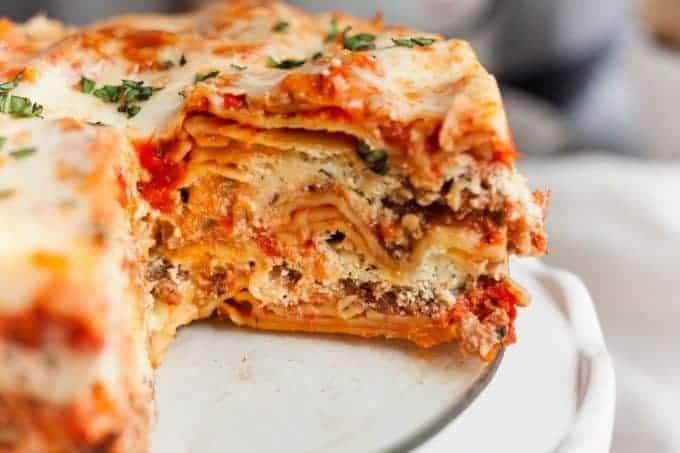 But, while this is a delicious lasagna recipe, it is meatless (which is great for my vegetarian son) and lacks the comfort food part of the perfect lasagna. 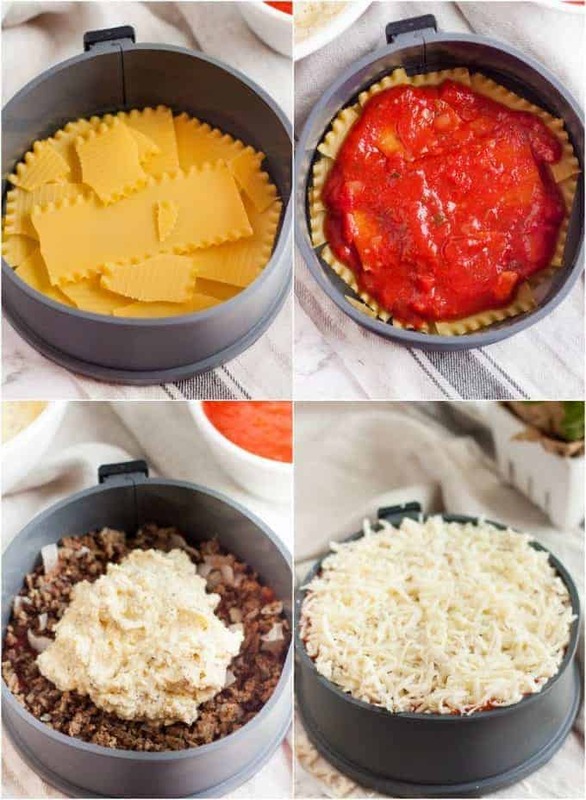 Enter… Instant Pot Lasagna. This no-boil noodles lasagna recipe is literally everything to me. The ricotta cheese, the gooey mozzarella cheese. It is loaded with herbs like basil, oregano, and thyme. It is truly a traditional lasagna recipe but made with ease in the instant pot. 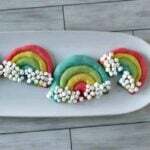 While this recipe is made primarily in the instant pot, it still takes some time to put together, but the bake time is significantly shorter by using the instant pot. Some recipes will have you brown your meat in the instant pot, personally, I prefer to do it on the stove top. If you want to brown your ground beef (or turkey or Italian sausage) in the instant pot, just turn the pot to saute and let it heat up. Saute until the meat is no longer pink and then add in the garlic and onion. Saute until the onions are translucent. Mix all of the “cheese layer” ingredients together in a bowl. Set it aside. Spray a sheet of aluminum foil with nonstick spray and cover the pan. Add 1 1/2 cup of water to the pot. Place the covered lasagna pan on a trivet with handles then place it in the pot. Lock the lid and seal valve. Press the manual button twice and set time to 25 minutes. Allow natural release for 10 minutes. Then, perform a quick release. 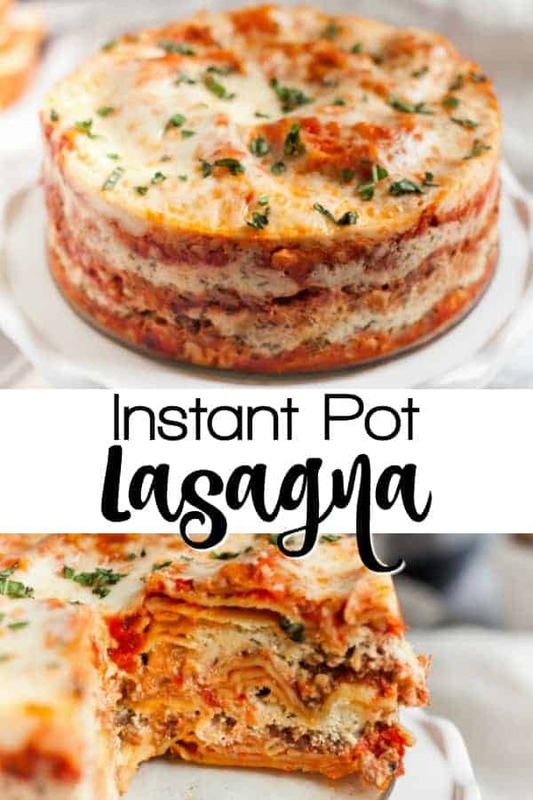 Open the Instant Pot and transfer the lasagna out. Remove foil. Place on baking sheet in the oven on broil until cheese begins to brown. Watch it closely so it doesn’t burn. Release the lasagna from the sides of the springform pan and garnish with fresh parsley if desired. Slice and serve. A springform pan is ideal for making this lasagna recipe because it comes out of the pan so easy when you release the sides. If you do not have a (affiliate link) springform pan (you should totally get one), you can also use a 7 inch (round) by 3 inch (high) round cake pan. Don’t even try it with a 2-inch high pan, it won’t end well! 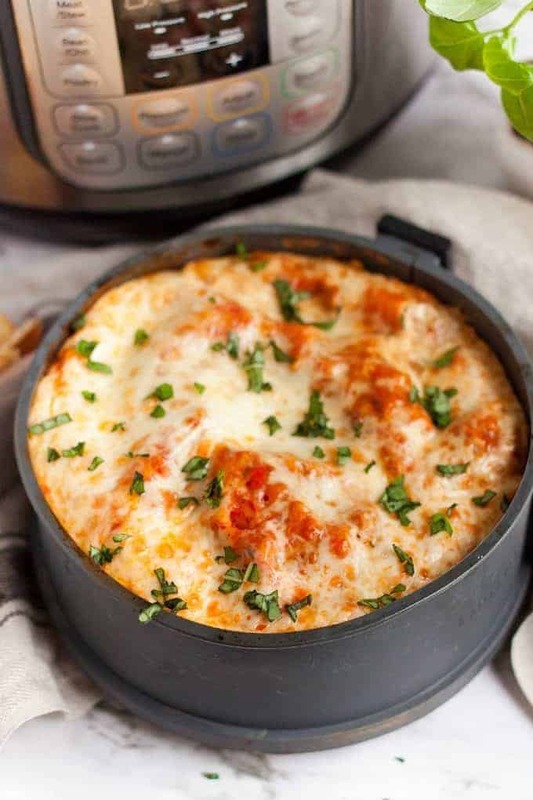 Instant Pot Lasagna is warm, cheesy and delicious. 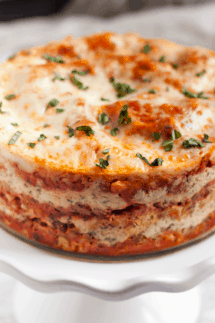 Just like a traditional lasagna recipe, it is layered with your favorite ingredients. Love it! 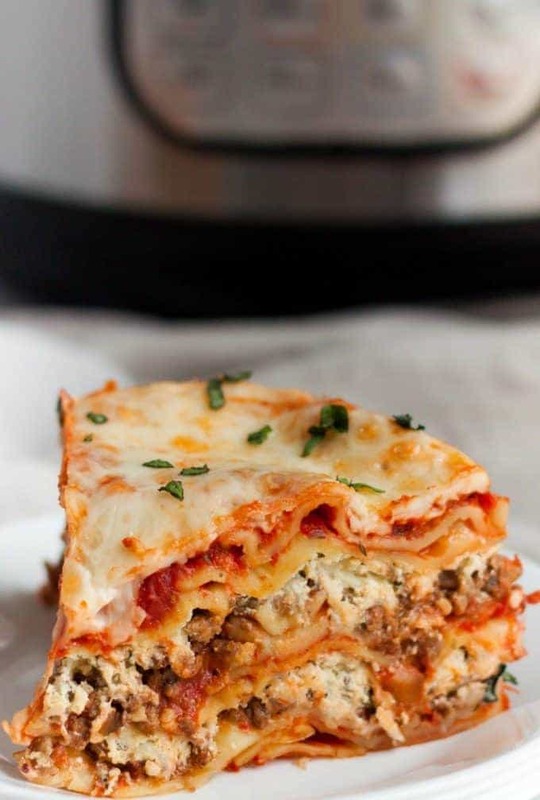 I always want lasagna last minute and this is the perfect way to make that happen. Looks so cheesy and delicious! This turned out perfect. I have a new favorite IP dinner! This was really amazing!! Everyone in my house loved it!! Best ever! In love with this one! I want this to be my birthday cake.